This is a dish that I've seen Ina prepare a few times. What I mean by that is that I've seen the episode in which she prepares this a few times, and yes, I always watch Ina, even when I've seen the episode more than once. So, I just saw this episode again the other day, and it seemed like a perfect dessert for this time of year. It looked so simple, and the plumped dried fruit looked like it would add great flavor and texture. The other inspiration for this poached fruit dish was a bottle of Essensia dessert wine which I received as a sample from Quady Winery. Ina suggested vin santo or sauternes, but any sweet, dessert wine would work well. The Essensia smelled like fruit and honey and the flavor was sweet, without being too much so, and there were hints of citrus. This is not a syrupy dessert wine, and the sweetness is well-balanced. The alcohol content is 15 percent which is in the range of vin santo in which the alcohol is usually between 14 and 17 percent. This would be a lovely wine to sip with some goat cheese and honey, and it was delicious as a poaching liquid for pears. The perfect poached fruit recipe is from the Barefoot Contessa Parties! book and it's also on the Food Network site. The pears were peeled and then seeded from the bottom. As suggested, I used a melon baller to cut into the base of each pear and remove the seeds. Then, the poaching liquid was made from the wine, sugar, cinnamon sticks, one split vanilla bean, a few whole cloves, and julienned strips of orange and lemon zest. That mixture was brought to a boil so as to dissolve the sugar, and then it simmered for 10 minutes. The pears were added and left to poach in the simmering, fragrant elixir for 20 minutes or until tender, and they were turned once during that time. Last, dried figs, apricots, and prunes were added and allowed to simmer until plumped. This was a comforting dish with the warmth of the spices, brightness of the citrus, and freshness of the pears. The combination of fruits and spices in the wine sauce tasted like pie without the crust. I was struck by the richness of it given that it was just fruit, wine, sugar and spices and had to stop and think about the fact that it was a fat-free dessert. It wasn't calorie-free, but it was fat-free. This can be made in advance and chilled, and since leftovers continue to absorb the flavor from the poaching liquid, it gets even better by the next day. Essecenia is a great wine. I made a honey syrup with it one year with honey, the wine and star anise - were tasty and very sticky, but I digress - I love poached fruit and I can only imagine how tasty this dish is. You've made a believer out of me, I am now going to have to watch Ina. I've only recently started poaching fruits. I've got to try using wine next time. I'm sure it brings another flavor to it. 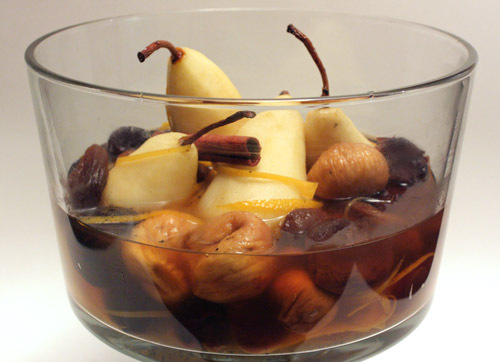 Spiced wine poached fruit look exquisite! Beautifully done, this looks great. I think it would go awesome with ice cream, or greek yogurt. Oh I'm loving the looks of this. I can almost imagine the wonderful falvor of those fruits together! This looks great! 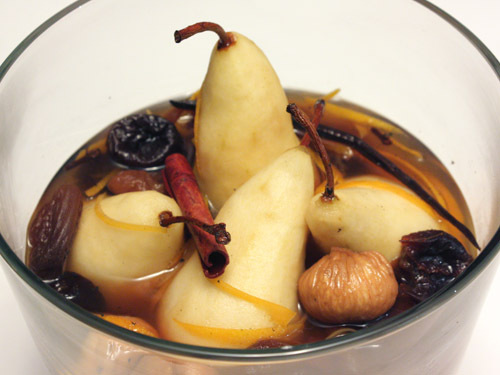 I've always wanted to try poaching pears but too bad my hubs is not a big fan. My old time favorite, simple and delicious. This looks delicious. During the summermonths I poached fruit for the first time and I loved it, but this looks perfect for this time of year. What a tasty looking winter dessert! And it looks beautiful too!!! Eye candy! So elegant and appropriate for this time of year. And I bet it's just delicious. I even throw a little port in...this is a great big bowl of YUM in my book! The wine is good, but I hope you had a glass for your efforts! Love your dessert. Must smell so good. I watch Ina repeatedly too. The fruit looks amazing and simple to do! This looks delicious, elegant and so comforting. So glad I came across your blog. I'd love to try poached fruit desserts! I've a few recipes for these that are of Asian origins! Thanks for inspiring me! The photo at the bottom, wow! Love it! I'm so glad you tried this, Lisa. I watched Ina make it a couple times and really have been meaning to try it. Glad to hear it's as ambrosial as it looks! I will have to give this a shot. One of my favorite pear desserts is put 1 cup chianti with 1 cup sugar, cinnamon stick, couple cloves, and vanilla bean in the bottom of a 9x9 pan. Stand the pears up in the liquid and shove in a 400 degree oven until done (about 30 minutes). Pour the chianti syrup over the pears with some honey. Wow, this looks super! 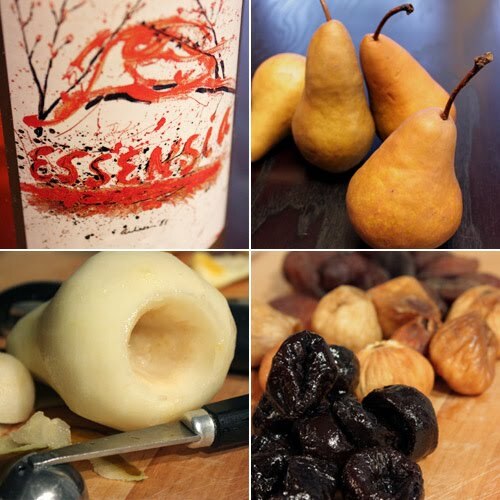 I made poached pears with the wines from this company the other day: www.academiewines.com. I used the blend #4 which I believe is a blend of Viognier, Pinot Gris and Moscato. Very floral and aromatic (hints of white peach and pear) and it was amazing as it reduced down! I'll try Essecenia next time!